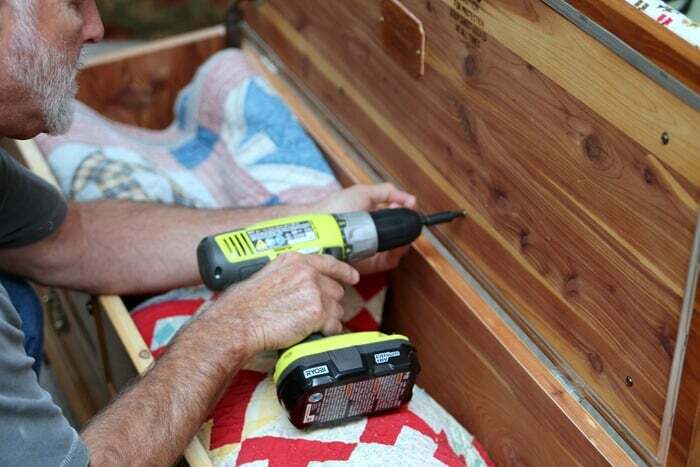 Today I’m sharing how to recover a Lane cedar chest…and the cedar chest is mine. It was a birthday gift from the hubby and kids a long time ago. I never got a cedar chest when I graduated from high school. That was the thing a number of years ago. I recovered the original padded seat with blue fabric several years ago. When I was cleaning my workshop out (it’s really happening this time, photos to follow soon) I found a thrift store treasure. 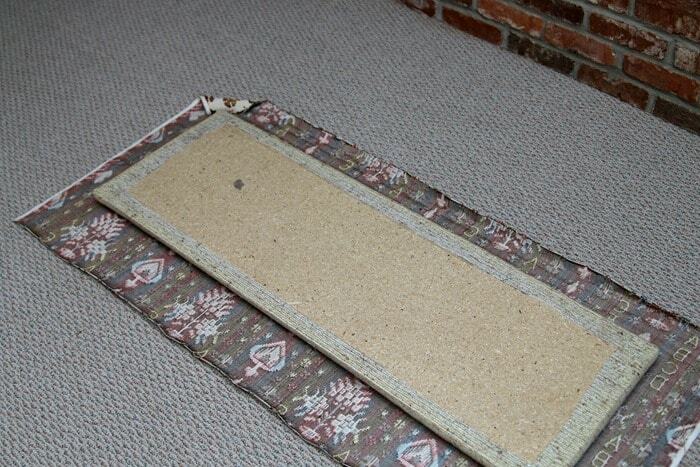 It’s a remnant of upholstery fabric I bought a few years ago. I fell in love with the design and the colors. Time to do something with that fabric. This is how the cedar chest has looked for the past few years. 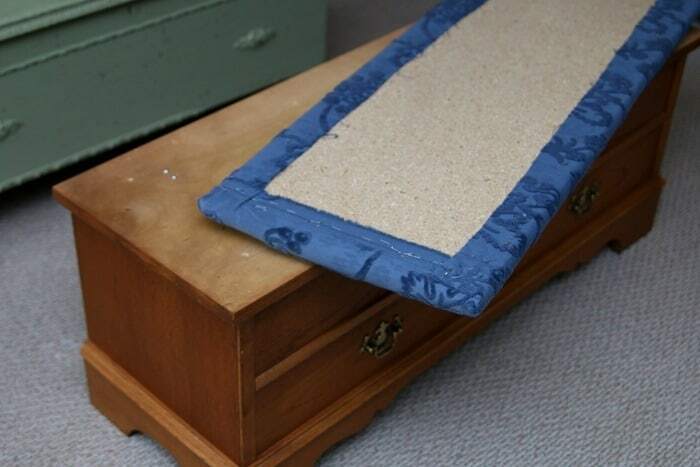 It sits behind our sofa and we use it to store quilts. My sweet hubby even had the chest inscribed…With Love On Your Birthday…Jason, Tammy, & Ray. Something to be treasured. This is the fabric for the makeover. It has a raised design and almost looks like cross-stitch. I remember it was pretty pricy but I couldn’t resist the colors and the beautiful texture. 1. Remove the padded seat top. 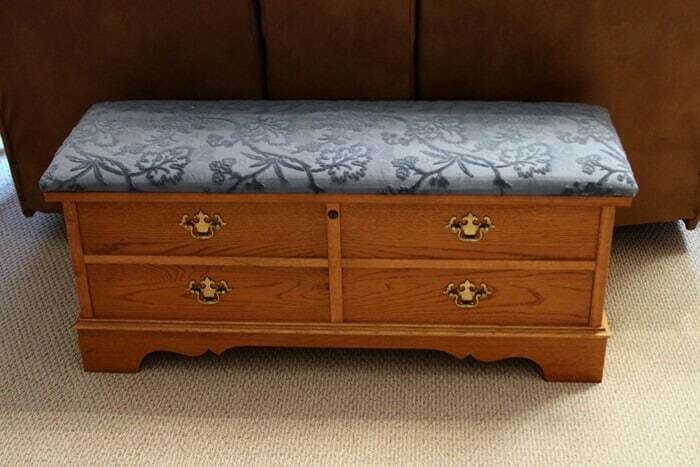 The top of the chest is two pieces, the padded seat and the wood top. I used a drill to remove the 8 screws holding the padded seat to the top. We’re talking a 5 minute job. Using a screwdriver would take a bit longer but not much. The JTS removed the staples holding the blue layer of fabric to the seat. I left the original fabric on the padded seat and just added another layer of fabric. 2. Cover the seat with fabric. Lay the seat upside down on the wrong side of the fabric and cut the fabric. Cut the fabric large enough to staple to the backside of the seat. I worked on this project in the living room floor. That’s where the chest was so no need to take it to the workshop. The project is simple and takes no time at all. I usually cut a larger piece of fabric than needed. Better too much than too little. Using a heavy duty stapler start on one long side and staple the fabric to the seat. Next staple the fabric on the opposite side….pulling it taught as you staple. When stapling the fabric on the two short ends of the seat start in the middle and work to the outsides. 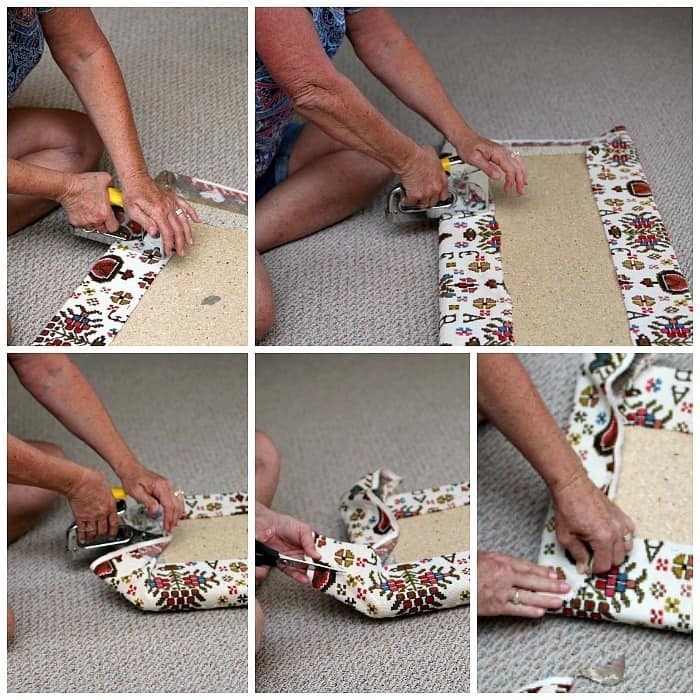 Cut away any extra fabric at the corners. 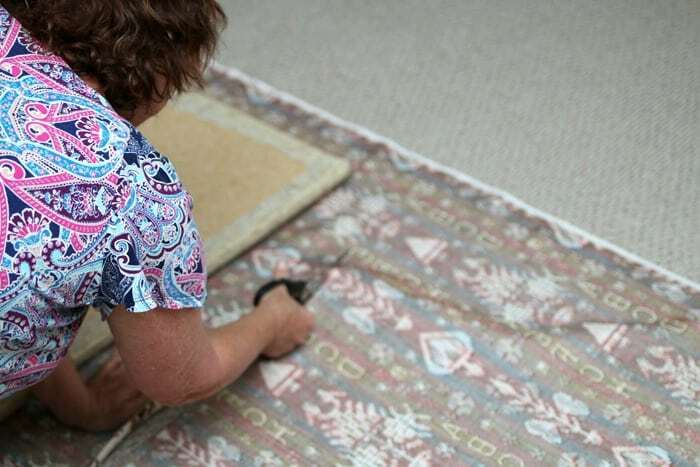 If the fabric is heavy and thick it is necessary to remove as much fabric as possible at the corners. 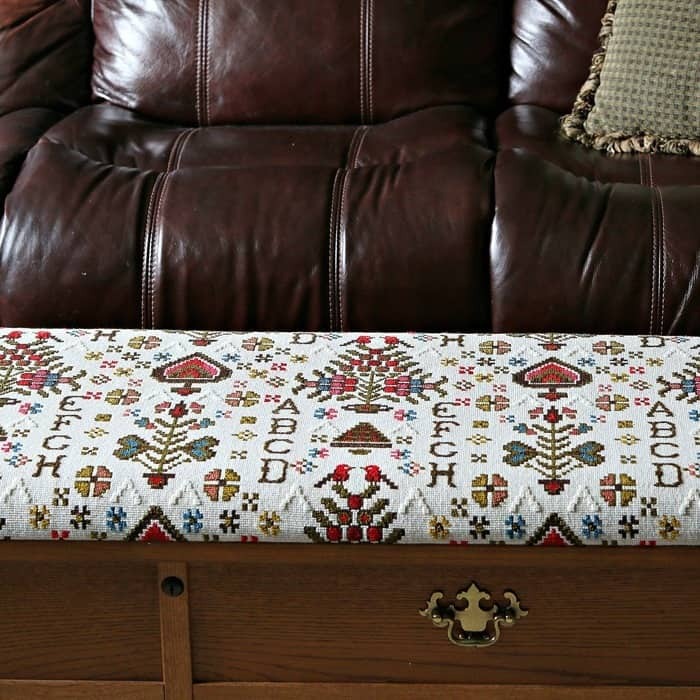 You don’t need a big bulge because the padded seat will not lay flat against the top of the cedar chest. 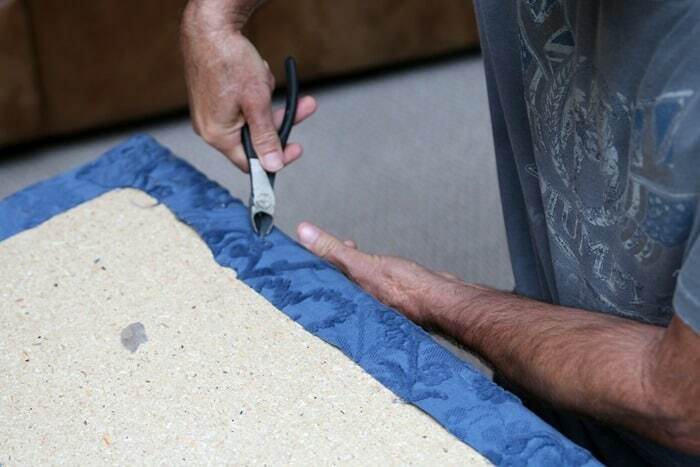 Work the fabric at the corners until there are no creases or folds to be seen from the top or edge of the seat. This is just something you have to work with. There is no one way to do it. Staple until secure. 3. Re-attach the seat to the top. 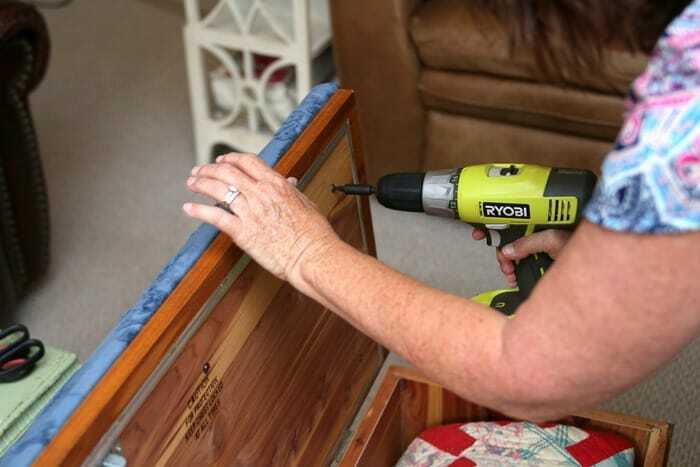 Using a drill or screwdriver replace the 8 screws to re-attach the seat to the top. That’s all there is to it. Ta-dah! How nice is that. 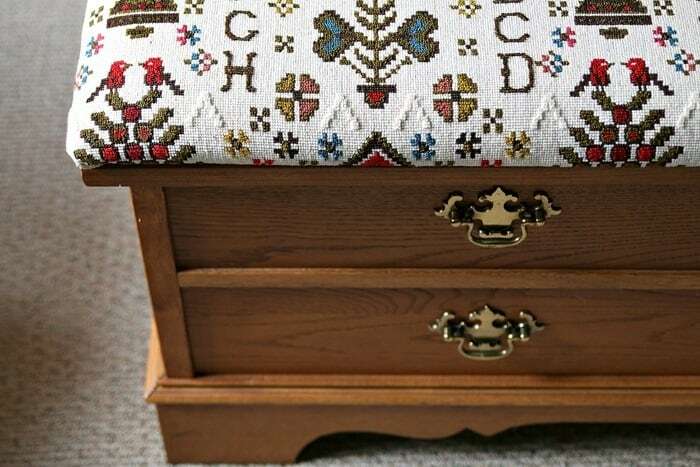 The fabric really livens up the cedar chest. Can you see the texture in the photos? I don’t know what type of design this is I just know I love it. 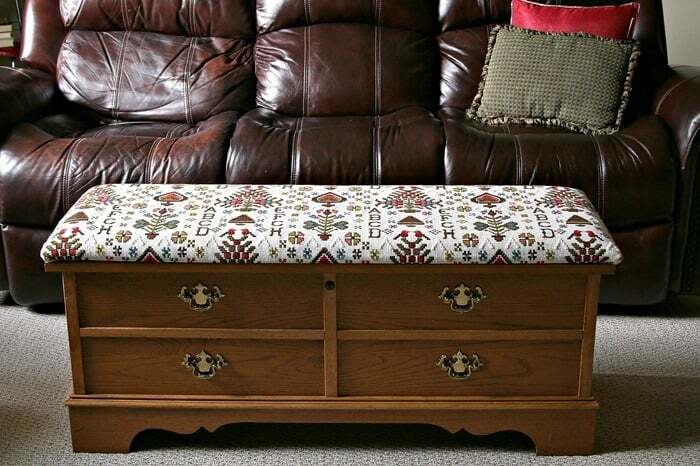 The newly recovered chest is sitting in front of the sofa but it will have to go back to it’s place behind the sofa. We use Sofi’s toy box as a coffee table and the upholstered top of my cedar chest might not hold up well to drinks and food. What do you think of the change? Do you like the fabric? 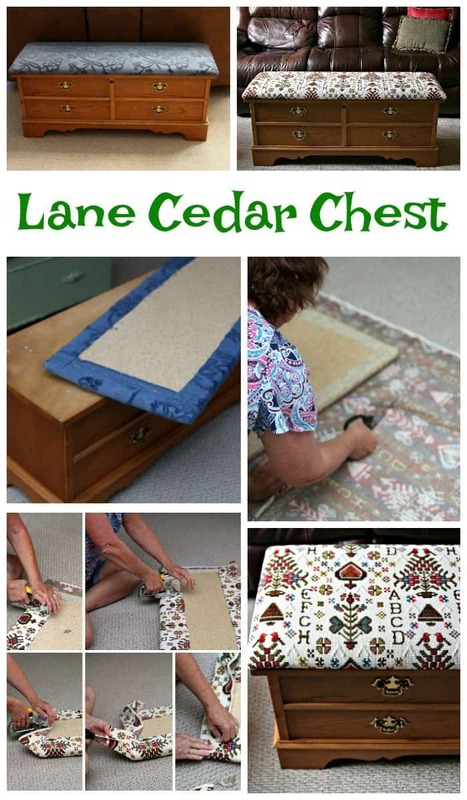 Do you have a cedar chest? Does it have a padded top? Have you recovered a simple chair seat? Leave me a note and I’ll see you guys tomorrow. Have a great day. How much fabric did you use? I have a Lane Cedar Chest and I want to change our the fabric. It will be a first for me. Thanks for the how to!!!! I’m not sure how much fabric. My chest was kind of long. Probably like yours. 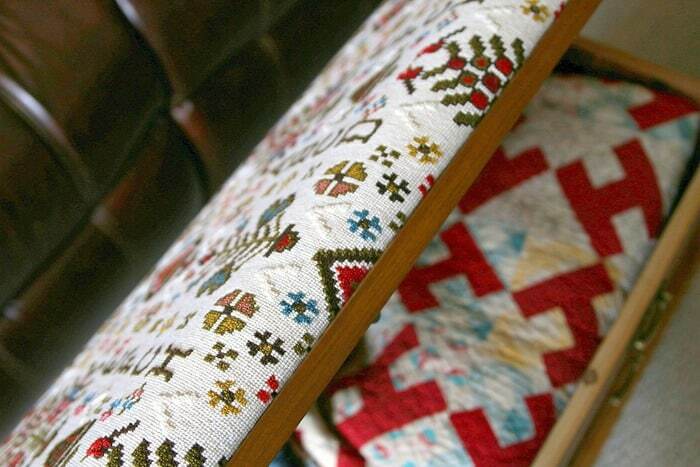 I used upholstery fabric which is wider. I don’t know if regular material is wide enough. If using upholstery fabric I would say you need at least 3/4 yard. So I guess you aren’t selling that puce, right? Nope, not selling it Terri! You’re welcome. Happy fabric hunting. My parents gave me my padded Lane chest for my 16th birthday and it’s still one of my favorite pieces of furniture. The tapestry fabric has needed to be replaced for years and I never knew how. I had NO IDEA you could just unscrew the padded top! I love your fabric choice – I can’t wait to start picking out mine now that I know what to do! Glad I could help Lynda. Get busy girl! Kathy, your idea for new material is great. A simple way to update or refresh a timeless piece. 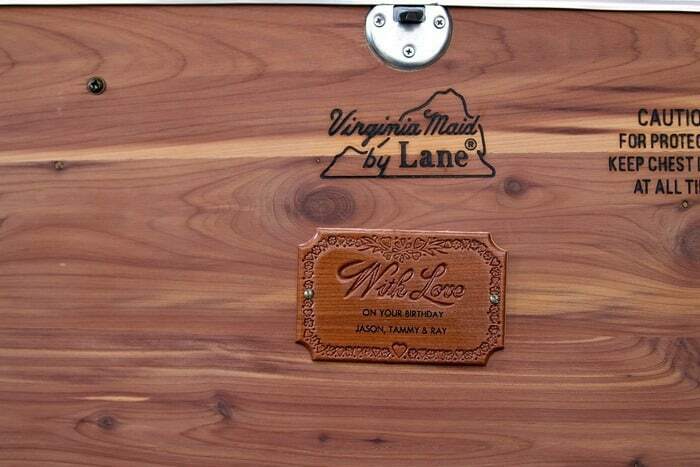 I did get a Lane cedar chest for graduation. I thought it was a strange and unique gift. I didn’t know it was a “thing” to give at one time, so your comment gave me a chuckle. Left it behind when I moved out and years later was telling my Dad how much I liked it. He was surprised because he thought I didn’t like it, but had kept it anyway. So 25 years later I got it back and gave it to my new daughter-in-law. Not sure she liked it, lol, but it’s still in the family as my son kept it when they split up. “My” cedar chest has traveled a lot and you never know, it may come back to me one day or end up with one of the granddaughters. Meanwhile, it does not have a padded top, surely it could be done? I like double duty furniture (and everything else)! I have that exact same cedar chest! I received it from my husband before we got married. I have recovered mine too. It is a timeless and treasured piece! Love the fabric you chose too! I love the fabric, it’s perfect for the chest. Great “How To” – quick and easy and not many tools required. My Lane doesn’t have a padded top but I’ve been wanting to paint it and finally did 2 weeks ago. I’m in love with the fabric as well… beautiful job. Your new fabric is terrific! I love the cheerful colors on the white background. It sure does brighten up the “old cedar chest!” Great job. Thanks Barbara, it sure does brighten it up. 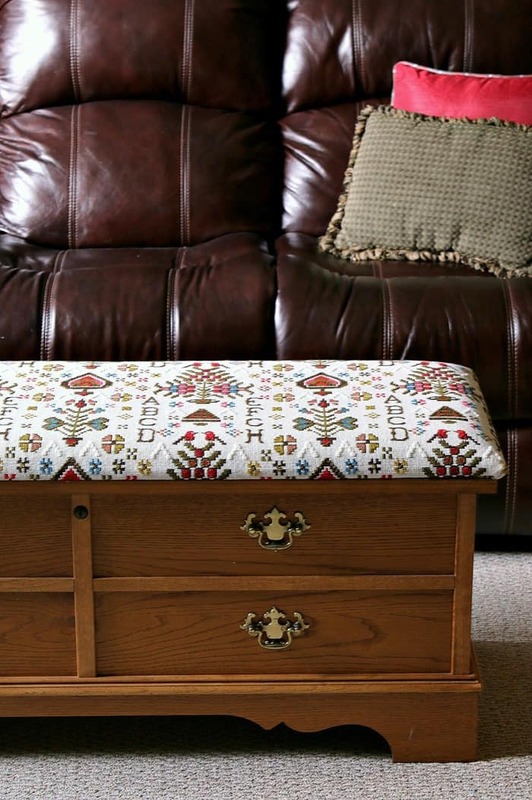 Your fabric selection is perfect for that piece – it’s beautiful. My Lane chest is mid-century modern blond oak….not my style but still useful. Nice job, Kathy! Love the sweet fabric. Looks Pennsylvania Dutch to me. That speaks to my heart as my dear Mom was Pennsylvania Dutch. Oh for some Shoo Fly Pie! This is so funny, because I just bought material from Joanne Fabrics to cover my hope chest that is just like yours except mine is a darker wood with white ceramic knobs. I love changing my fabric every few years. Love how yours turned out!!! Love the new fabric…so pretty!!! 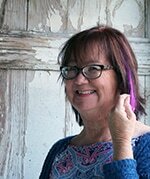 Kathy, wonderful job and a great tutorial! 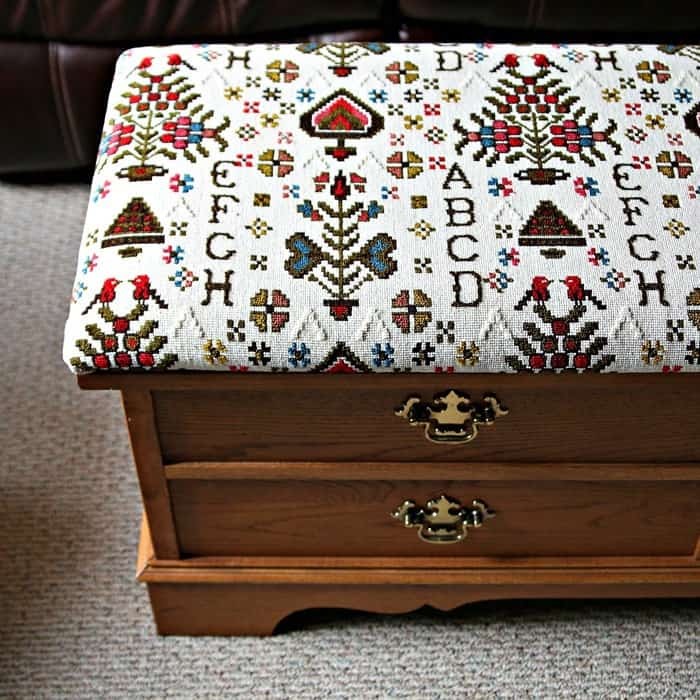 I love the fabric and it really compliments the cedar chest. 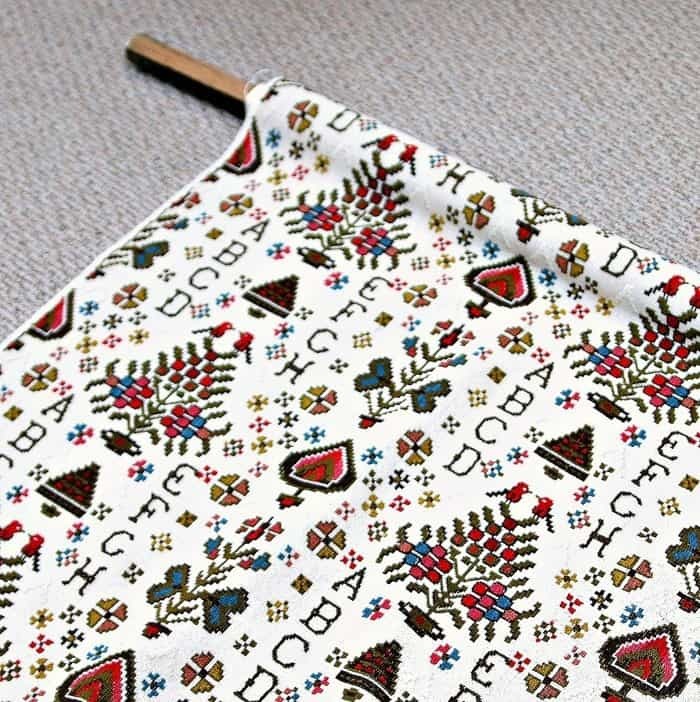 I believe you call this a Pennsylvania Dutch design fabric! It was well worth the extra price you paid for it!! I love that fabric too. I would call it representative of Pennsylvania Dutch designs. I love those small footstools. I recover them and keep one in my walk-in closet so I can easily get to the top shelf. Love that fabric. I’ve never seen a cedar chest with a seat on it like that. Very cute. I have been procrastinating on this same project! I think the pad on mine has welt cord around the top edge. Think I could just eliminate that & do it like yours???? Love your fabric!!!! Wanda, you may want to use a layer of batting, then you fabric to “hide” the welting! Wow – love the fabric. Reminds me of an embroidered sampler. Great job! That fabric is Gorgeous and I bet it adds great color to your living area. 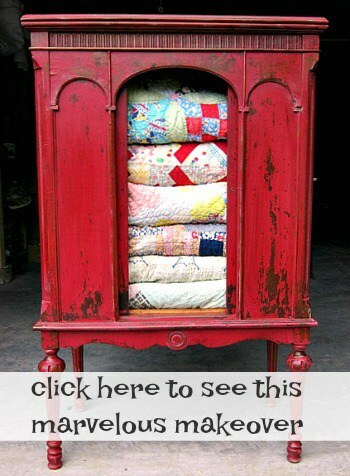 Looks like folk art fabric and I love it. Wonderful job on the recovering and what a wonderful keepsake chest with name plate inside. Nice piece to hand down from generation – generation.